Growing your marijuana business is highly dependent on bringing in new dispensary customers. There are usually many other dispensaries in your city so the shops that wish survive need to capture their local market share at a higher rate than the competition. Many new dispensary owners begin their marketing campaign using industry websites such as Leafly and Weedmaps while totally ignoring search engine optimization. This is a huge mistake and the data presented in this article will explain why. Here are some important statistics regarding retention of dispensary customers. The odds of selling to a current customer is 60-70 percent. The odds of selling to a new cannabis client are 5-20 percent. 80 percent of your future profits will be generated from just 20 percent of your existing dispensary clients. 65 percent of a dispensaries business will be generated from existing clients. 32 percent of dispensary owners state retaining marijuana customers is a priority. A typical recreational or medical marijuana business will lose 15 percent of its clients each year. 27 percent of dispensary owners estimate that 11 to 20 percent of new customers do not return to their business. According to surveys the typical male customer spends around $647 a year on cannabis products, while female users drop to about $634 each year on marijuana sales, That is relative to an average of $645 a year on spent alcohol and $1,000 a year spent on coffee, according to data from Headset, which monitors marijuana transactions from recreational dispensaries. The average marijuana transaction is around $25 dollars with an average profit of approximately $8 dollars. We can easily calculate that 1000 new customers per month would equal $8000 profit for the business. This figure assumes the customer makes one purchase and never returns to the dispensary again. 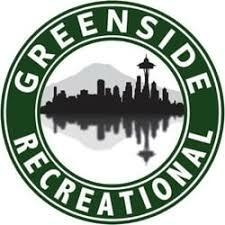 The average retention rate of recreational marijuana dispensaries is on average 40 percent. That means that 60 percent of the customers will revert to other recreational marijuana shops. The important rule for the dispensary owner is that if they do not capture those new customers 40 percent will NEVER visit their shop and stay with the first dispensary that they found. Since the average profit per sale for a dispensary is 32% a customer who stays at the same shop will provide $204 dollars per year in profit for a dispensary. Let’s say the average dispensary pulls in 1000 new customers a month that would equate to $20,400 in profits per month. How do customers find Local Recreational Marijuana Dispensaries? From the chart above we can see that a whopping 65 percent of dispensary customers find shops via search engines with 12 of the other options being related to an online presence. 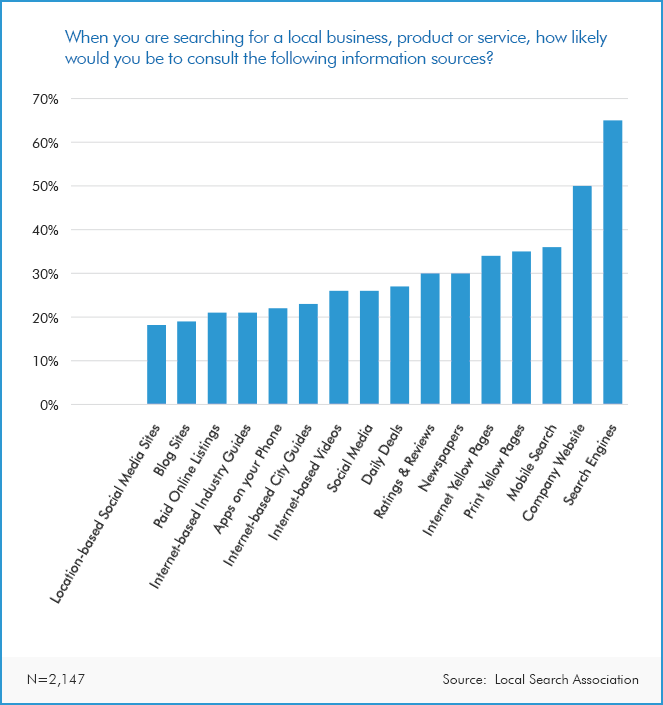 Looking at the chart below we can see that Google dominates all local searches. With these numbers, the marketing manager should be able to deduce that investing in search engine optimization is the best way to bring in new customers. 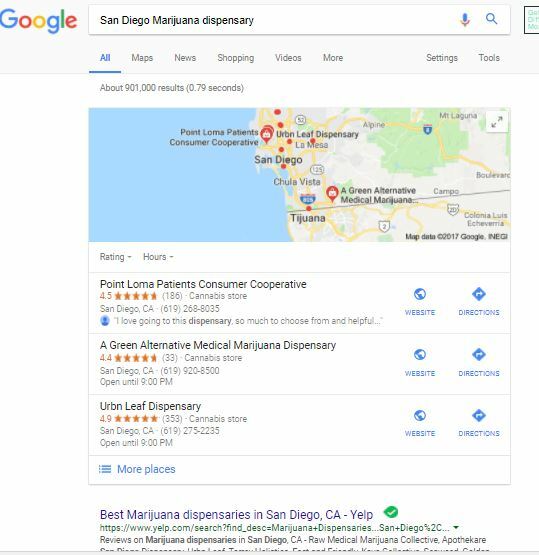 Let’s look at a typical Google search for a marijuana dispensary in San Diego California. You can see that the top 3 results are directly from Google’s three pack, this is the prime real estate you need your dispensary to dominate. 97 percent of all clicks come from the first page results of Google and the first listings get 33 percent of all clicks. This means that if your business is not on the first page of Google those customers are going to your competitors. Another thing you should pay attention to is that Weedmaps and Leafly are not in the top 4 results. Every consumer knows about Google, how many know about Weedmaps or Leafly? 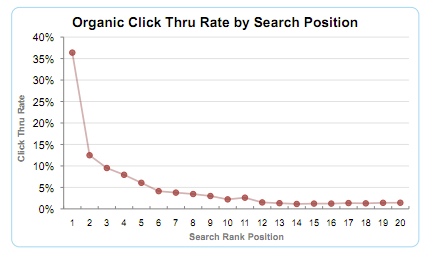 This chart above shows how customers click on search results. As you can see it is critical that your business is number 1 for your primary search terms as the second place position drops in half. That means if you are getting a 1000 new customers per month from Google being in a second place you are loosing a 1000 new customers by not being number 1. 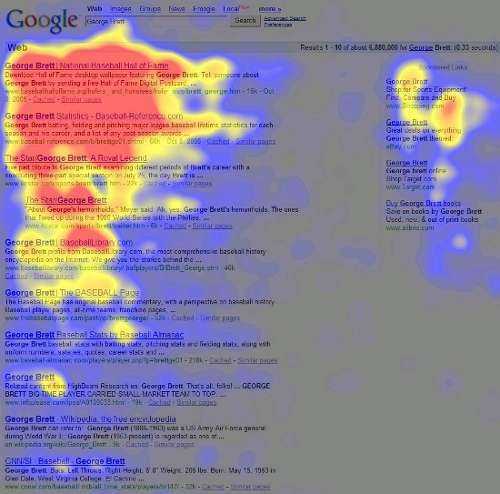 This is a heat map that shows where potential dispensary customers click when they are doing a google search. As you can see the majority of business is coming from the top 3 search results with results plummeting after position number 4. This chart above is a monthly report for one of our recreational dispensary clients for where their referral clicks come from. One thing you should notice is that the real world data matches almost perfectly to what most research companies report. In the chart above it says that Google has 83.3 percent of the search traffic while our real-world data says 84 percent. 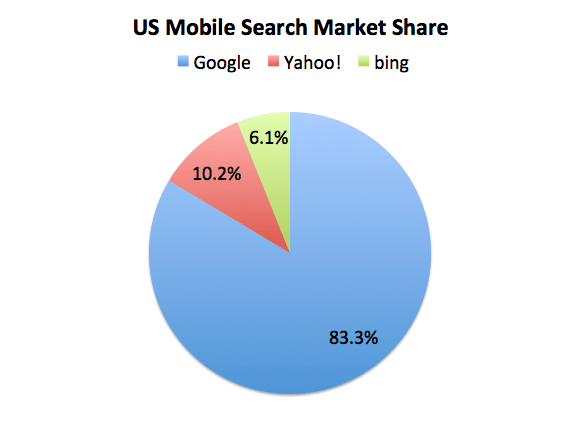 Bing and Yahoo use the same search engines so that total is 9 percent while the chart above reports 16 percent of the search traffic. 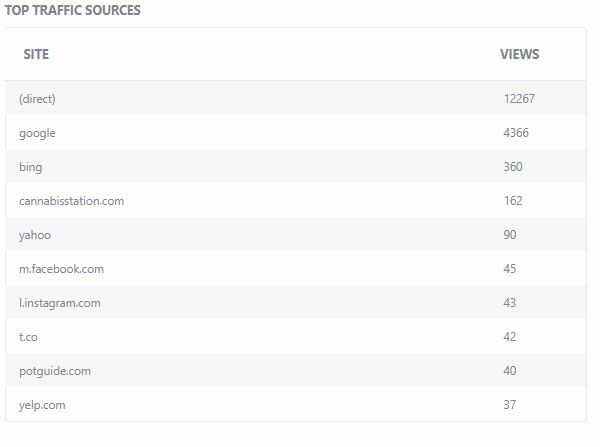 Another metric that should stand out is that we see no traffic from Leafly or Weedmaps the industry leaders. Though the data presented above we can calculate that Google Bing and Yahoo brings in approximately 4816 new customers per month. If each transaction produces an 8 dollar profit that comes to $96,320 dollars per month and for a year that translates into a profit of 1,115,840.00. Now, of course, clicks do not translate into actual customers coming through the door. Some could be repeat customers, but if you add in the fact that you will retain 40 percent of the customers the numbers should balance out nicely with repeated sales. Isenselogic.com specializes in recreational and medical marijuana search engine optimization. The owner is a former Microsoft database engineer and medical marijuana dispensary owner. We understand the fierce competition and the technical side of the cannabis business. Our monthly rates are only a fraction of what Marijuana directory sites charge and we guarantee that our services will deliver at the minimum 10 times more customers than any other form of online marketing. Every day that your business is not at the top of search engines you are losing market share to your competitors. Contact us today for a free SEO audit and competitor analysis. Click Here to see some of our client’s Search Engine Results. How much is a Marijuana Customer Worth? 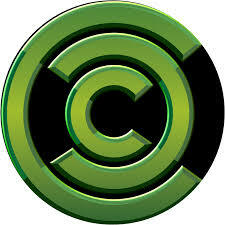 PreviousPrevious post:Marketing Your Hemp or CBD Business on the InternetNextNext post:How much does Leafly charge to Advertise? It is amazing and wonderful to visit your blog. Thank you for sharing your knowledge on this subject. Pingback: Are you looking for Marijuana SEO? Isenselogic.com Specializes in dispensary marketing.